In 10-inch skillet, heat oil over medium-low heat. Cook mushrooms and spinach in oil 5 to 7 minutes or until mushrooms are tender and spinach is wilted. Unroll pie crust on cookie sheet. 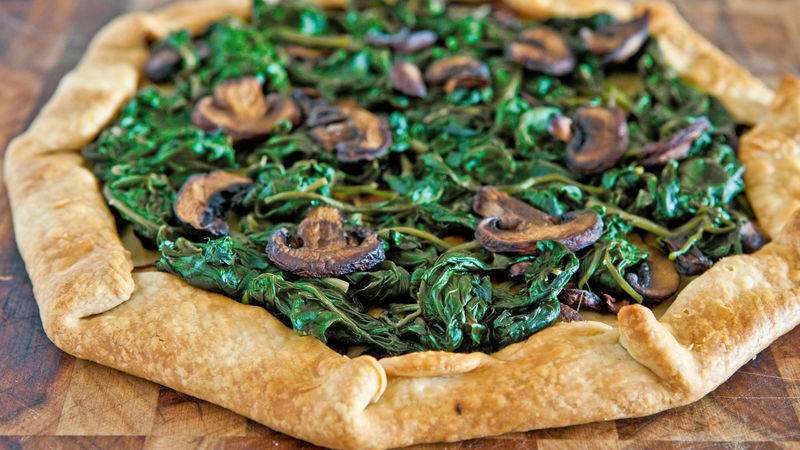 Spread mushrooms and spinach evenly over crust, leaving about 1 inch around edge. Fold crust edge over in 2-inch sections. Continue around whole pie. Bake 18 to 20 minutes or until crust is golden brown and crisp. Kale can be used in this recipe in place of the spinach. To add more flavor, sprinkle goat cheese pieces on top of pie after baking.